Illegal, Unreported and Unregulated (IUU) fishing continues to be a bane not just locally – but also internationally, and enforcement personnel of the Belize Fisheries Department met today to discuss a proposal for the Belize Fisheries Department to begin using “automated aircrafts” or unmanned conservation drones to police Belizean waters. Whereas the drones are being considered for fisheries law enforcement, there is the question of whether the prototypes could help in anti-narcotics surveillance—since much of the narco-trafficking is presumed to also happen along the coast—as well as border surveillance to help stave off illegal activities, such as clandestine gold panning. 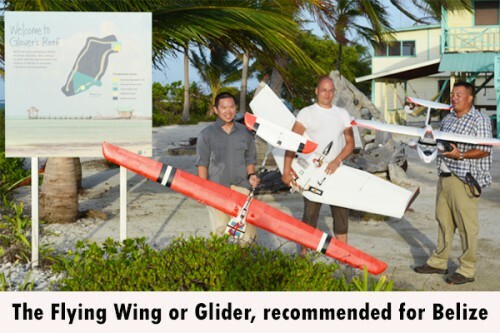 Three prototypes of the conservation drones were recently tested in the Glovers Reef Marine Reserve area, at the request of the Belize Fisheries Department, with the support of the Wildlife Conservation Society. Lian Pin Koh, founder and director of Conservation Drones.org and Simon Wunderlin – Conservation Drones’ technical director, were in Belize to demonstrate how the drones could be used here. They report that over 40 GB of video footage was collected during the testing phase. The three UAVs were deployed from Middle Caye, and it was determined that the most suitable UAV to achieve the surveillance/enforcement objective is the Flying Wing. This is so because it can handle winds of 25 miles per hour and has the least breakable parts. It is also able to survive crash landings. According to ConservationDrones.org, the low-cost unmanned aerial vehicles could be used for surveying wildlife; monitoring and mapping terrestrial and aquatic ecosystems; and supporting the enforcement of protected areas. The drones can fly autonomously or they can be manned from the ground. They run flights of 30 minutes to over an hour, over a range of 30 km to over 50 km, while acquiring high resolution photographs and high definition video footage. They are also able to produce geo-rectified 2D photo-mosaics and 3D Digital Surface Models of surveyed areas, the Conservation Drone proponents say. In the Belize context, the conservation drones are primarily being considered to combat IUU fishing in the face of escalating costs for manpower and fuel. Fisheries authorities say that the cost of operation of a patrol vessel is exorbitant. Julio Maaz of the Wildlife Conservation Society, who was intricately involved in the testing, told Amandala that the use of the conservation drones is attractive, because they could help improve surveillance and reduce the Government’s fuel bill for fisheries enforcement. In fact, we understand that the testing of the conservation drones was proposed in the Fisheries Enforcement Strategy of May 2013. At US$2000 a piece (but US$6,000 with all the accompanying gear and maps), the drones appear to be an attractive alternative, since 75 HP boat engines run in the range of US$6,000 and the boats themselves in the range of US$7,500, Maaz detailed. The Fisheries Department could acquire two drones in the first instance, he indicated. The model that is recommended for Belize is the Glider – or the Flying Wing. Maaz said that the UAV could be charged with solar panels, which would lead to further energy efficiency and savings. The UAV/conservation drones serve as a deterrent, Maaz explained. The downside is, though, that the drones must remain grounded in bad weather. The testing was done in July and the report with recommendations was filed in August. Fisheries Department staff would need to be trained in operating procedures and piloting to effectively maneuver the UAVs, the team has explained. According to Maaz, there are some current limitations which they will work to improve upon, such as real-time video viewing, which is now limited to a range of 1 km. This is important because real-time video will allow the Fisheries Department to be more efficient at responding to illegal fishing caught on camera. Fisheries officer Lyndon Rodney, who is leading the initiative for the Fisheries Department, has informed us that senior officials of the Fisheries Department intend to review the recommendations made in the report on the UAV testing, before they make a final decision.